Tasks are individual items that can be prioritized and selected to reoccur based on due dates. To create tasks and assign them to specific members of a workspace, use the Project Management tab drop-down and click Tasks & Milestones. Assignee - to assign the task to workspace members. CC - to copy workspace members on the task. Recurring - to set a time interval for task recurrence. Note: the next occurrence of a recurring task will be created once the current task is completed. Tags - to assign keywords to categorize tasks or improve search results. Reminders - to send email notifications to assignees prior to the task due date. This Task depends on - to designate the task as dependent upon another task. 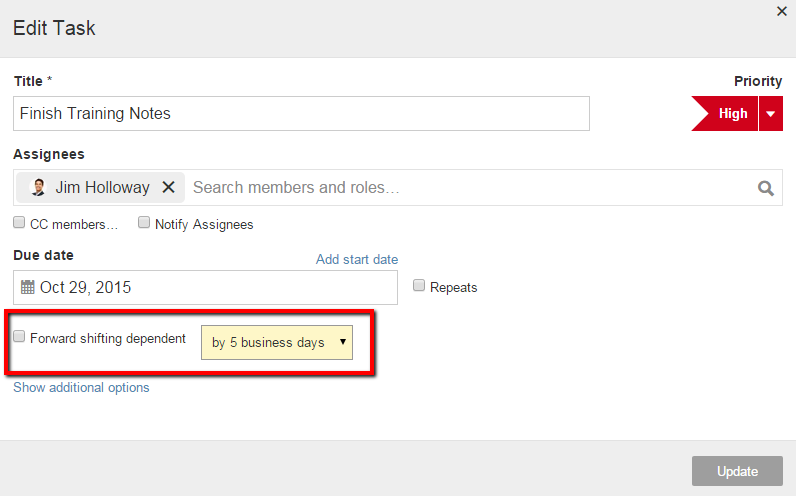 The start dates for dependent tasks will shift if you edit the start date of the preceding task. If you only edit the due date of the preceding task, then only the due date of the dependent tasks will shift. 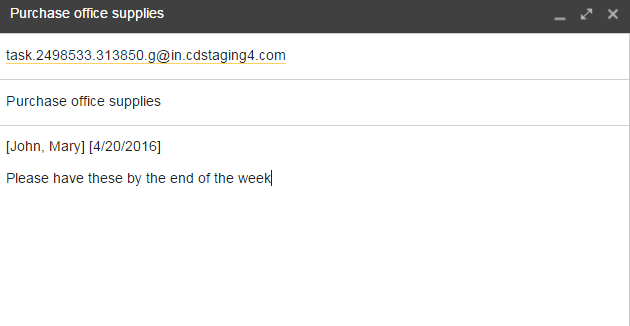 Notify via Email - to send email notifications to assignees and CCs about the creation of the task or edit of the task details. Note: the member creating or editing the task will not receive an email notification even if assigned to the task or listed as a CC. To view the tasks associated with a specific task list, click the task list title. By default, tasks are sorted by priority. Tasks can also be manually sorted by priority, title, assignee, start date, due date, and time spent or any other column in the task list view by clicking on the field headers. Change the status of a task by checking the box to the left of the task title and then select the drop down arrow to mark the task as "To-Do", "In-Progress", or "Completed"
When a task is marked complete, it is crossed out and hidden by default. Completed tasks can be viewed by selecting the "Show Completed" option on the page. Completed tasks can be reopened to a "To-Do" status by selecting the checkbox next to the task and then selecting "Reopen". Quickly edit task details from the task list view using click-to-edit. To click-to-edit a task, hover your cursor over the column you want to edit until you see the edit icon appear, double click your cursor, and make your changes. Only workspace members with "Edit" permissions will be able to click-to-edit tasks. Changes made via Click-to-Edit will not trigger an email notification to subscribers. Edit the task title, description, assignees, due date, etc. Change the priority of the task. Attach files by either selecting from a folder on your computer or dragging and dropping it into the attachments field. Add a link to a file that is already stored in the workspace. Assignees: You can assign a task to yourself, another member of the workspace or a member group. If roles are enabled in the workspace it is also possible to assign a Role to the task. When you choose to "Add link to file", a dialogue box will open that will let you select a file that is already being hosted in your workspace. Move the task to another task list or workspace. Email a comment into the task. Display and copy the task Permalink. After an action is made on a task in the task list view, a message stating the task action will display. To undo the action action select "Undo". 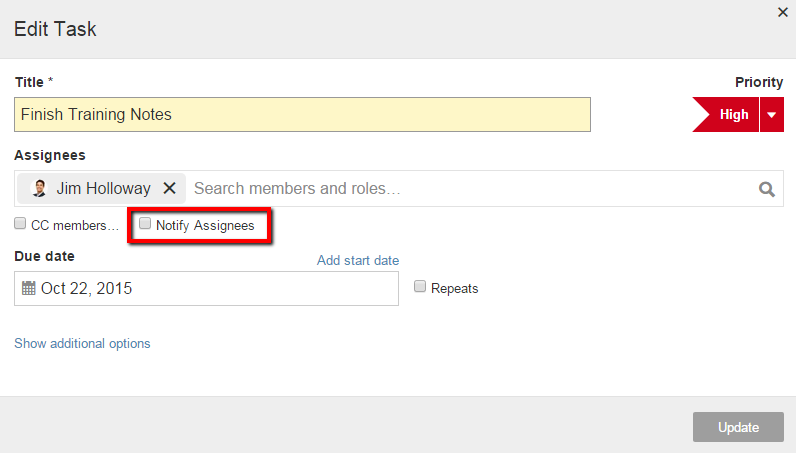 The "Notify Assignee" check box will automatically check when the task assignee (s) or CC(s) is changed. This option will let the new assignee(s) and CC(s) know the task has been assigned or CC'd to them upon updating. This option can be toggled off in the case a user does not want to notify the new assignee(s) or CC(s). Tasks can be linked to other tasks that are in different task lists and/or milestones. When tasks are linked, one task is considered the predecessor and the other is considered the dependent task. This allows dates of the dependent task to shift accordingly if dates for the predecessor are changed. The shifting of start dates and due dates is independent of each other. Modifying the start date will not shift the due date and vice versa. Files can either be Attached or Related to tasks for quick referral to files relevant to the project. To learn more, visit our article about Attached vs. Related Files. With the upcoming release of the new Milestone List you will also be able to bulk edit your task's custom properties! Select a few of your tasks in a task list, or in your inbox, and click the 'more' button that appears above the list. 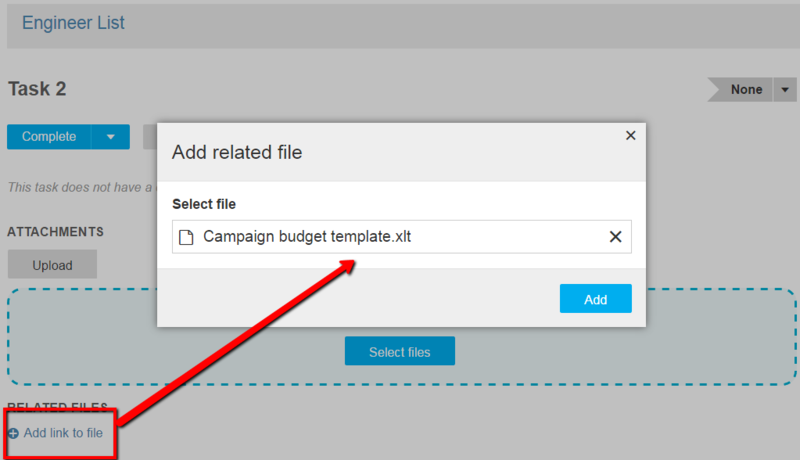 Clicking 'Bulk Edit' will present a box with a drop-down allowing selection of custom fields. Please ensure you click 'Apply changes' to save your edits.